Boy, there is a lot going on over the next 7 days! Yet I have created a plan that allows me to stick with my Three Week Plan. Friday: We are having some friends over for dinner. I am planning DIY fajitas or burritos. I am going to modify a 100 Days of Real Food recipe for Slow Cooker Flank Steak Fajitas by using a combination of Del Monico steaks that were in my monthly meat delivery from Walden Local Meat and some chicken breasts rather than all flank steak. 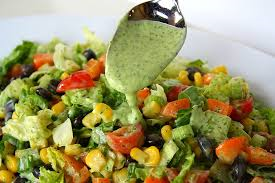 I’m also making Southwestern Chopped Salad with Cilantro Dressing. I’ve made this salad before and it’s very good. I’ll probably also make a few cheese quesadillas for the kiddos, plus rice and beans to add to burritos. My guests are bringing hummus, veggies and tortilla chips for an appetizer and a dessert. Sunday: Super Bowl Sunday! My brother and sister-in-law are hosting a little family gathering. My sister-in-law who isn’t typically as fond of cooking as I am shocked me by sharing she is planning to make: sweet potato w/ roasted red pepper dip and a spaghetti squash pie. They sound right up my alley and delish! Can’t wait to try them! They are also doing steak tips and I’m bringing chicken teriyaki and my simple spinach salad (spinach, cherry tomatoes, carmelized onions and homemade balsamic vinaigrette). Tuesday: OK! Finally back to trying out some Jumpstart to Skinny recipes per the Three Week Plan. Tonight I’m planning Gourmet Pork Chop. I’ll make a couple of baked potatoes for the rest of the family to go along with it. Wednesday: Tonight I won’t be trying out any new recipes. In my town we have a community based volunteer network called the Neighborhood Brigade. Primarily the group provides meals to individuals and families going through some kind of crisis. I am signed up tonight to provide a meal to a family where the mother just underwent back surgery. So, I don’t want to deliver anything experimental and I don’t want to make two meals. This family is one adult and one child so I am going to make one large pot of White Turkey Chili, deliver half and keep half for us. Rather than using 2 lbs of ground turkey, I am going to use 1 lb ground turkey and one pound ground beef from my monthly meat delivery from Walden Local Meat. I will also deliver either corn muffins or fresh baked bread from a local bakery. Thursday: Debra is coming over for dinner and I’ll be trying out another Jumpstart to Skinny recipe: Mexican Fiesta Fish. I had planned to try this last Friday, but I ended up having a lot of other leftovers on hand and decided to eat them instead. I'm passionate about nutrition and fitness!